Contemporary and spacious, this family-friendly hillside villa features a large private swimming pool, well-equipped gym, and panoramic sea views. Amenities satellite LCD TV/DVD, stereo, air-con bedrooms, fully equipped kitchen, BBQ, WiFi broadband internet. Mullion Cove is a spacious and comfortable 4 bedroom villa located on Bophut Hill, within 5 minutes drive of the popular Fisherman’s Village and beach. Facing panoramic sea views over the north coast to Koh Phangan, Mullion Cove is conveniently located as a base from which to explore the islands main attractions. The walled property is designed around the swimming pool and views, and is entered on the top floor. The entrance lobby features a skylight and comfortable sofa, and opens onto a large balcony. On either side of the entrance lobby is a double en-suite bedroom. The master bedroom features vaulted ceilings, wooden floors, and a large bathroom with twin sinks, walk-in shower, and a large free-standing terrazzo tub, benefiting from sea views. The second bedroom has an en-suite bathroom with walk-in shower. An open stairway leads down to the main living area on the pool level. The huge open-plan living room faces the pool deck, and features a comfortable lounge with sofas and a large screen LCD TV system, a dining table seating 8, and a fully equipped kitchen. Off the kitchen is a bathroom that can also be accessed from the pool deck. On the other side of the stairway is a detached pavilion containing 2 further double bedrooms. The first has a private terrace and an en-suite bathroom with a terrazzo tub. Set in front of this bedroom, on a slightly lower level is the fourth bedroom, which also has a private viewpoint terrace and an en-suite bathroom with a terrazzo tub. Both bedrooms have steps down to the poolside terrace which runs across the front of the living room. The expansive sand-wash pool deck is furnished with sun-loungers and parasols. To the right of the pool is an outdoor dining area, barbeque and a covered sala pavilion that appears to float on the view. Beyond the pool is a grass lawn which is bordered by a glass security barrier, and overlooking the lower gardens and sea views beyond. A stairway descends from the outdoor dining area to the lower level, which includes a covered lounge area, and a shower set amidst verdant tropical gardens. Mullion Cove is stylishly furnished throughout, and presents a tranquil, comfortable, and convenient holiday home that is well-suited for couples, families, or groups of friends. 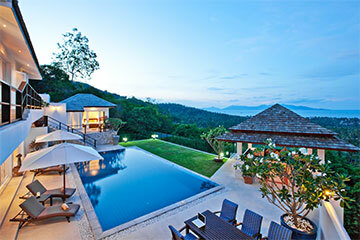 The villa is located on a hill-side, about 10 minutes drive from Chaweng, 5 minutes from Bophut Fisherman’s village, with Santiburi Golf and Country club some 20 minutes drive away. Rates are for the entire property, with 4 bedrooms sleeping up to 8 guests. -Airport transfers are charged at $35+ USD per trip, subject to 7% tax. *Return airport transfers are included in 2019, one trip each way. 10% off within 15 days of arrival. Cannot be used in conjunction with other promotions. Not applicable to Xmas/NY. A baby cot and high chair.